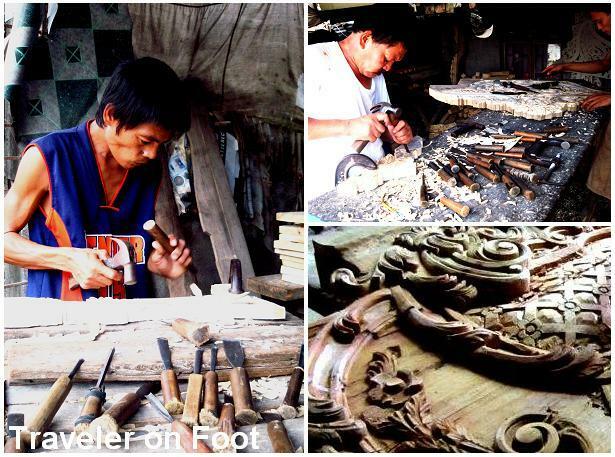 While traveling along the old Olongapo-Gapan Road, furniture workshops display their exquisite woodworks on the side of the road. We’re in Betis, a quiet town in Pampanga that has been known for its church murals and mastercarvers of European-design furniture. Being one of the oldest towns in Pampanga, Betis’ exact history is difficult to trace. If historians have given different dates to the town’s foundation, ranging from the 1570s to the early1600s, local folklore has inspired the origin of the town’s name. According to one legend, the town was named after a giant tree known for its scientific name as Bassia betis Merr. This hardwood once stood in the site where Betis Church now stands. It is said that the tree was so huge it cast its shadow on the nearby town of Guagua. When it was chopped down, the timbers were used as the framework of the church of Betis. Despite being 300 years old, the church of Betis is well-preserved. 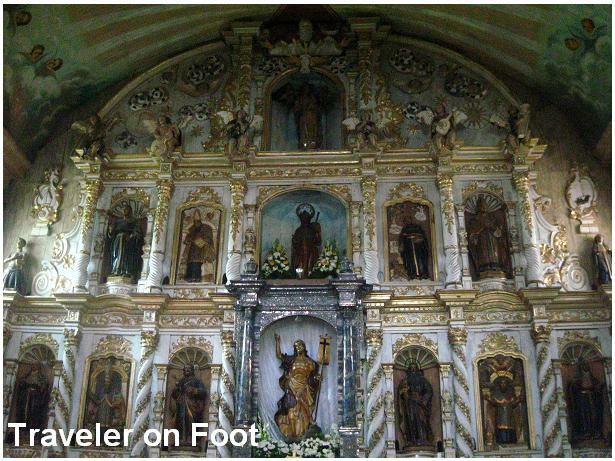 The original church made of light materials was built around 1660 and was placed under the advocation of Santiago Apostol (Matamoro). Fire broke from inside the church several times that the Augustinians erected on the same site a church of stone in the 1770s. The church is listed as a National Cultural Treasure. Detailed woodcarvings on grand old timber adorn the church’s interior. The intricately-carved wooden door depicting the Dreams of Jacob from the Old Testament and the elaborate retablo furnished with authentic statues are fashioned of beautiful lumber. Whether they belong to the legendary betis tree no one can truly say. Spectacular murals interpreting the scene from the Bible adorn walls and the entire wooden ceiling. Painted by a team of local artists when the church was renovated in the 1970s, Victor Ramos (who heads the three-man team) used old photographs to simulate the trompe l’oeil effect on arches, vaults and frames based from the original pre-war design by Macario Ligon. Exiting the church, we passed by the first artesian well in Betis. Built by Father Manuel Camanes to provide water to the entire town, it is now protected by an iron fence. On the courtyard, a familiar scene cast in stone of the Holy Family in their carpentry shop in Nazareth. It symbolizes Betis’ devotion to the Catholic faith and to the time-honored woodcarving tradition. The rich tradition of woodcarving in Betis dates back to Spanish times when the locals became engaged in woodcarving, carpentry and shipbuilding. Woodcarving was a craft that the locals learned from migrant Chinese artisans. The woodcarving industry became a thriving business as a result of the demand for the Spanish colonizers for retablos and religious statues for churches. Replicating altar pieces gave Betis woodcarvers (mandukit) their earliest exposure to European art and designs. With the rise of the wealthy townspeople who went on trips abroad, bringing back with them the latest European influences, a new demand for manufacturing of European-design furniture flourished. This new clientele wanted the interiors of their houses to emulate the homes of the affluent Europeans. 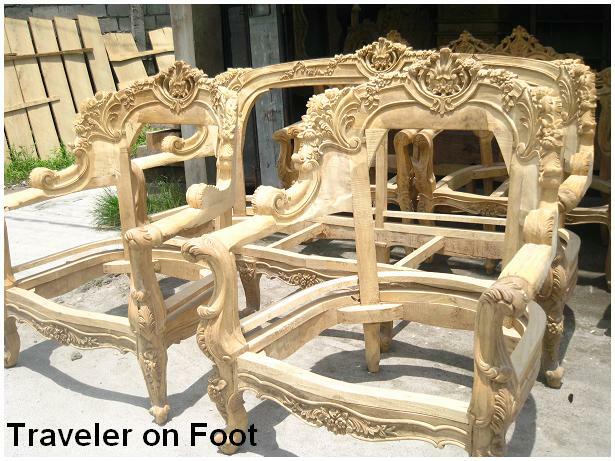 By the latter part of the 20th century, the much-revered mastercarver Apong Juan Flores gave prestige to Betis as a producer of world-class furniture. He created masterpieces that won him acclaim both locally and internationally. This fame drew the attention of then first Imelda Marcos who commissioned Apung Juan for furniture and artworks for Malacanang. FRIENDLY MAKATI. One of the things I like about the location of my current work is that it is near Old Makati or Sampiro de Makati. I’m referring to the Poblacion and Bell-Air areas. The environment in this part of Makati is different from the often fast-paced and snobbish Ayala Central Business District and Fort Bonifacio. Despite of some modern structures and high end establishments, the area still keep a sense of tranquility particularly along Nicanor Garcia Street. AVENIDA DE REPOSO. Nicanor Garcia Street is formerly known as Reposo, which means to repose or rest. The place was called Plesantero or pleasant place during the Spanish times. According to Guillermo Gomez Rivera, Reposo was a place outside the pueblo or town. It was a park and a cemetery but along the road was a row of vacation houses owned by the old rich and stretched as far as the old Camino Real (now Sta. Ana) and Pasig River. Behind and along the vacation houses also were vast rice fields and a row of fire trees, brought from Spain by the Ayala and Rojas families. It is believed that the famous Nicanor Abelardo wrote and composed the romantic song La Perla del Pasig, the Mutya ng Pasig in his rest house near the river along Reposo. PASEO ALONG THE OLD REPOSO. The serene environment of Reposo was conducive to gatherings of people. It was a picnic area and a favorite place for street parties and other affairs especially in May just before the beginning of the rainy season. These celebrations were complete with bands, dances, rondallas and zarzuelas. STREET ART. An organization called Grupo Reposo is actively working in transforming the old Reposo strip as a premiere art destination particularly for the visual, culinary and performing arts. One of their first projects is to adorn the outer walls of Manila South Cemetery with artworks by some of the leading Filipino contemporary painters. While walking along the strip, I immediately recognized the works of Armida Francisco, Aileen Lanuza, Joey Ibay, Jose Tence Ruiz Jr., Elmer Torio, Vincent de Pio, Egai Fernandez, Hermes Alegre and Lydia Velasco. CHURCH OF SAN ANDRES. Just across the Lydia Velasco mural is the treasure of Reposo –the Church of Saint Andrew the Apostle. 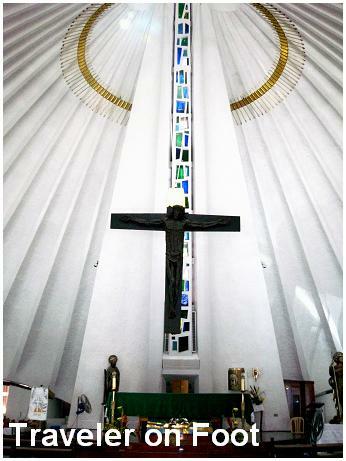 Built by National Artist for Architecture Leandro Locsin in 1968, the design of this parish church in Bel-Air Makati is symbolic of the manner the martyr died crucified on an X-shaped cross. The butterfly shaped floor plan emanates from this cruciform. Many other symbolic features mark the tent-like structure, including the giant chandelier over the altar which serves as a halo over the copper cross by National Artist for Visual Art, Vicente Manansala. EPILOGUE. While Makati will always be associated with its soaring concrete buildings, commerce, and shopping, a walk around in its old district revealed a city alive in history, culture and art. Some of the murals on southern side of Reposo Street from the corner of Jupiter Street are gone. It was scrapped off or covered by galvanized sheet to give way to a condominium building. We’ve heard so much about the 1950’s Pandesal Pan de Amerikana’s huge chess pieces that we decided to go to Marikina City one day to see it for ourselves. Pan de Amerikana is located within SSS Village, a vast residential zone in Marikina that we’re not familiar with. Upon reaching Concepcion Church in Marikina where turned left towards SSS Village. From a Meralco branch, we turned right stayed on the road until we’ve finally saw a windmill and the entrance to Pan de Amerikana. From the bakeshop’s entrance, we could see the bakers were busy taking out trays of freshly baked breads from a traditional pugon while eager customers line up for their orders. After making an order at counter, we went straight to the garden café. The lushness of plants and the vines dangling from the trellis made the garden café look wild and rustic though obviously cared for. We choose a table nearest to the giant chessboard –the main attraction of Pan de Amerikana. The almost life size chess pieces is reminiscent of the chess game in Harry Potter and the Sorcerer’s Stone. We had fun moving, lifting, dragging and sliding those big chess pieces on the giant chess board. With the inclement weather hanging over Metro Manila, I was hesitant in bringing along my four year old son Joaquin with me to Cory’s funeral honors this morning at the Manila Cathedral in historic Intramuros. But it was one of his ninongs who sent me a text message stating “sino pang Filipino ang susunod na bibigyan ng ganitong klaseng parangal sa mga susunod na panahon? …wala na” that convinced me to allow my son to witness a historic event unfold despite of the rains. The four streets surrounding Plaza Roma were painted with yellow ribbons and people wearing yellow. It was in front of the Palacio del Gobernador we met with Joaquin’s ninongs publicist Ben Calderon and Associate Solicitor Moses Florendo. Excited to see their inaanak, Ben and Moses took turns in taking my son and plopping him on their backs while we watched politicians, celebrities and VIPs walked in front us like in a red carpet premier. From the other side of the velvet rope, the crowd cheered the popular and booed the infamous. At a quarter before 10 o’clock, the rain poured heavily. A sea of umbrellas filled the area. Most members of the crowd remained while there were some who went to the other side of the barrier. But the police force was courteous in controlling the crowd. The rain began to gradually stop when I received a text message from my wife that the coffin of President Aquino is being carried towards the cathedral’s main portal. She was monitoring the events inside the Cathedral from her office. We rushed towards Andres Soriano Avenue. As the truck carrying the coffin of the former president passed by in front us, the people flashed the Laban sign and shouted Cory! Cory! Cory! I was a couple of years-old younger than my son when Ninoy Aquino was assassinated and received the honor of a hero’s funeral from the people. I did not have any recollection of what happened back then. All I have are secondary accounts I’ve read in books. Being in Cory’s well-attended funeral in person not only made us feel that we’re one with the nation in witnessing a historic event it also gave us the honor of expressing our deepest gratitude to an extraordinary Filipino. As I conclude this article, I am watching on television the final funeral rites for Cory Aquino at the Manila Memorial Cemetery in Paranaque. The full honors given by the world, the state, the church, the military, her family and the Filipino people that I’ve witnessed today and during previous days after Cory’s demise reminds me of what Antonio Banderas has said in one of the scenes in EVITA: What a way to go! The Traveler on Foot joins the world and the nation in celebrating the fight Cory Aquino has fought for the Filipinos. Thank you very much President Corazon Aquino.